It's been over a month since As I Lay Dying singer Tim Lambesis was released on bail following his arrest over an alleged murder plot, and the metal vocalist has now issued a statement on the matter. I've come across many comments, both private and public, asking me to explain more about my case or to explicitly state what my current worldview is. First, I simply am not allowed to do either of those things. Some day I will be able to tell the story of all that has happened in detail to get the facts straight and representing the many sides to this fairly complex story. In the mean time, many of you will make your assumptions and take the sensationalism of the press focusing on selling points at face value. I can't stop that from happening, and I've learned something by not having that kind of control. The people who want understanding will wait until the formalities and trials are done. Strangely enough, those type of minds are the people least likely to be judgmental even if I am found guilty. Those reporting from the courtroom will only pass along select facts and the case itself will only require select facts that do not encompass the entirety events. On the other hand, the seemingly larger percentage of people delight in voicing their opinion even though I personally have never said a word about even a single detail related to my case. Unspecific to me, that is a terribly sad reality greatly in contrast to the type of discussion I intend to start by choosing to post again. Second, all I have the ability to do right now is keep learning. By posting again I hope to attract people like me who are willing to look at all sides of a philosophical issue to learn before they speak. In fact, I'd be happy if this whole thing was just a way to recommend further readings to each other. However, I do accept that there will be some true geniuses who will try to turn each comment section into what topic they would like to discuss instead as if they created the original post and we all stumbled on their page. I'm out on bail, but on house arrest. My family has jobs and the ability to run errands or take an afternoon/evening out. I have the unique opportunity of being able to focus and study like I may never have again in life after this. While I can't say that I always enjoy it, it is more valuable than I originally acknowledged. Lastly, while I can't say exactly what it is I believe epistemologically or metaphysically, I can explain what I'm interested in learning. I grew up in a Christian home and held that belief myself for many years. In the process of sincerely trying to defend that belief in a scholarly way and shortly after finishing my degree, I felt that it was unreasonable to call myself a Christian in light of the evidence. Many AILD fans picked up on the not-so-subtle hints at my worldview change in a couple songs on Awakened. It was never really hidden. Anyway, after my incarceration I found myself re-evaluating topics that I had previously sworn I would never waste my time looking at again. Many can chalk that up as one point for pure boredom in an isolation cell, or you can look at it providentially as the needed circumstance and only possible way to get me to humble my mind. Either way, I don't want to just read aimlessly. These daily lists are a way for me understand what I've already covered and which topics I should get more material on to read more in depth. Since these lists are public, it is also a way for me to discover the ignorance of many people who post. To be most helpful, please stay on topic. Is the Foundation of Morality Natural or Supernatural? 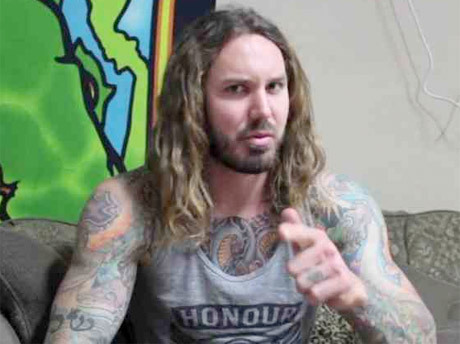 As I Lay Dying's Tim Lambesis Issues Defensive New Statement: "I Stand Against Who I Became in My Past"
As I Lay Dying's Tim Lambesis Pens Lengthy Apology: "There Is No Defense for What I Did"